It was a stroke of marketing genius on the part of the madams and pimps of Japan's 17th century red light district to call their digs the Floating World. Ukiyo in Japanese, the phrase came to signify not only a locale distinct from the rest of Edo, the city known today as Tokyo, but a singular state of mind. Entering the Ukiyo -- technical name: Shin Yoshiwara, meaning "New Lucky Field" (the old Yoshiwara fell to the Great Fire of Mereiki) -- became synonymous with a certain kind of sensual transcendence. The marketing of this illusion is the subject of a clever new exhibit at the Asian American Museum in San Francisco. 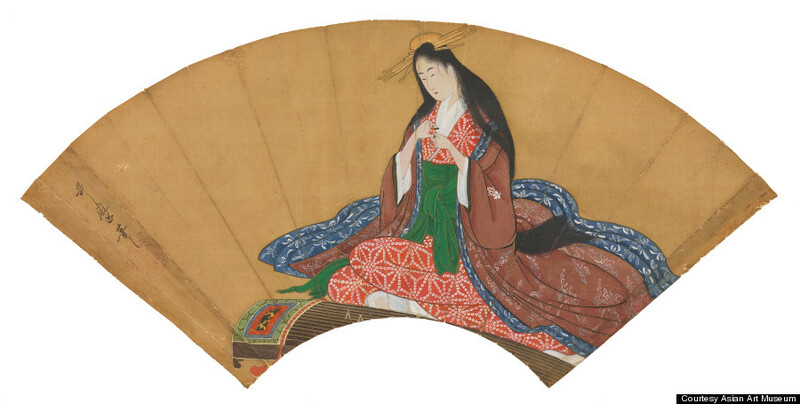 Aptly titled "Seduction," the lavish show brings together more than 50 works from the collection of John C. Weber, a New Yorker who has spent the better part of the last 20 years amassing one of the foremost Western collections of Japanese art. 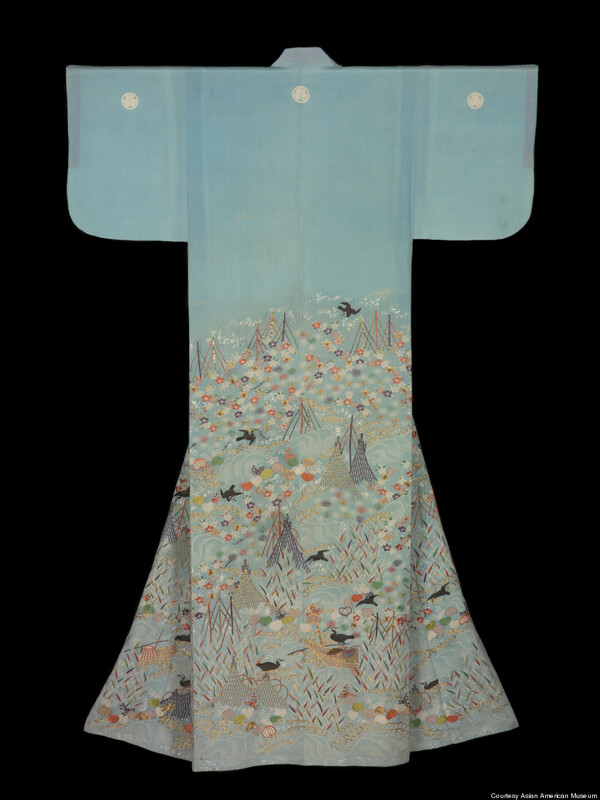 The works, which include kimonos, fans, and scrolls, make a double edged statement. For all their cherry-blossomed, old world romance, their existence speaks to the hard-edged winners' mentality of Edo period citizens. At the centerpiece of the exhibit is a hand scroll by the 17th century woodblock master Hishikawa Moronobu (who was also a legendary exponent of floating-world imagery). 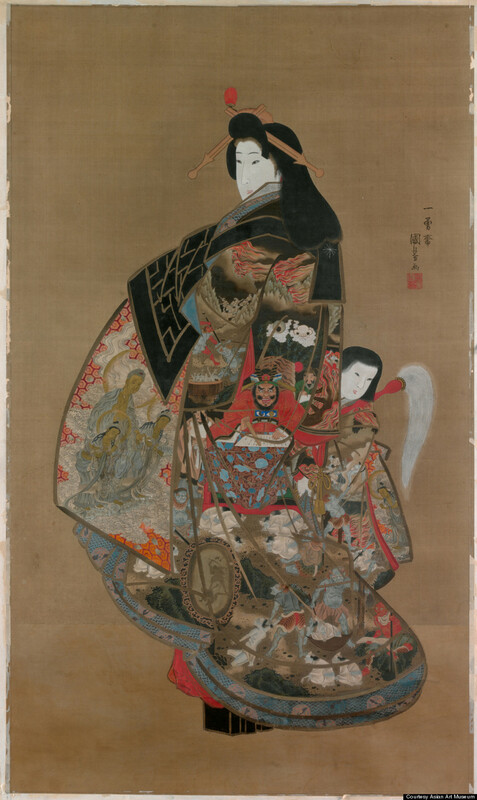 The title is clinical enough: "A visit to the Yoshiwara, late 1680s." But there is much to unpack in this nearly 58-foot scroll. Dotted in almost pastoral vignettes, it paints a rosy picture of the Ukiyo in its heyday. Men slice into great slabs of fish, women carry buckets of laundry -- the suggestion of intimacy is everywhere, but nothing is explicit. Life would hardly have been quiet in the Ukiyo. One account cited in the exhibit catalogue recorded at least 987 women living inside the quarters in the mid-1600s. A century later, the number hovered around 3,000. Women of the Floating World lived to serve men. Some worked out of hole-in-the-wall brothels, serving any old visitor willing to pay. Others were closer to courtesans, admitting only the wealthiest businessmen into tea-rooms, where assignations took place on schedule. All of the works in "Seduction" were commissions, carried out by artists doubling as advertisers. They range from legendary (the exhibit includes a work by the maestro of waves, Katsushika Hokusai), to unknowns, to artists who made their name specifically by way of Ukiyo, like Hishikawa Moronobu. All were engaged in what the "Seduction" catalogue succinctly terms "one of the great early successes of branding," casting what was essentially a 20-acre brothel in an ethereal light. It's a coup any ad exec today might be proud of. De Wallen brand managers, you listening? For more on "Seduction," opening Feb. 20, visit the Asian Art Museum website. Nishikawa Sukenobu (1671-1750), Sexual dalliance between man and geisha, c. 1711-16, hand-coloured woodblock print,. 1985,1022,0.1 © The Trustees of the British Museum.